Ancre Hill Vineyard01600 714152work VineyardWe planted the vineyard in two phases, April 2006 and April 2007 and grow four varieties, Chardonnay, Pinot Noir, Seyval Blanc, and Triomphe, the first of which we will harvest in October 2008. The vines sit on south facing slopes, in a sheltered valley with limestone soil and an ideal meso- climate. We planted the vineyard in two phases, April 2006 and April 2007 and grow four varieties, Chardonnay, Pinot Noir, Seyval Blanc, and Triomphe, the first of which we will harvest in October 2008. The vines sit on south facing slopes, in a sheltered valley with limestone soil and an ideal meso- climate. Our inspiration is to make a world class Quality Sparkling Wine, in the traditional Champenoise method, with its own unique terroir. We will also be specializing in producing Pinot Noir which will also be a Quality Wine with its own unique characteristics. 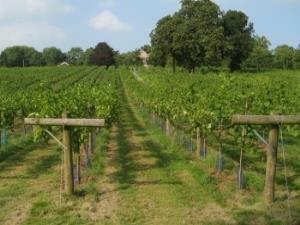 First class viticulture practices on an ideal site will contribute towards this goal. On the B4233 Monmouth to Abergavenny road. Situated on the outskirts of Monmouth (Rockfield Road).